Whenever I make these golden stir-fried potatoes that are crispy on the outside, soft on the inside and coated with a mixture of spices, I think of the word begin. It’s a good way to begin Indian cooking. First, it’s potatoes: starchy, universal, comforting and the baby ones, very cute in their roundness. Everyone loves potatoes, and these are potatoes with an Indian twist. It’s a low risk and easy dish to try. Second, it uses most of the basic spices in Indian cooking: asafetida, cumin seeds, turmeric powder, cumin and coriander powder, cayenne pepper powder or red chilli powder, dried mango powder. So if I went out and bought these spices for Indian cooking, here’s one dish that uses all of those. Third, it’s a forgiving dish. I can add a little more spice, a little less. I continue to be intrigued by Indian spices, and this dish helps with some of the mystery as I use my fingers to sprinkle the spices and watch how the spices coat the potatoes. I carry over the same technique to cauliflower, peas and other dry vegetable (sookha sabzi) preparations. The use of dry powdered spices in this manner is essentially a North Indian cooking technique. I recommend boiling and skinning the potatoes a couple hours ahead in time, leaving them on the counter and stir-frying the potatoes just before you sit down to eat. It only takes ten minutes or so to make these, and they are best hot off the stove. 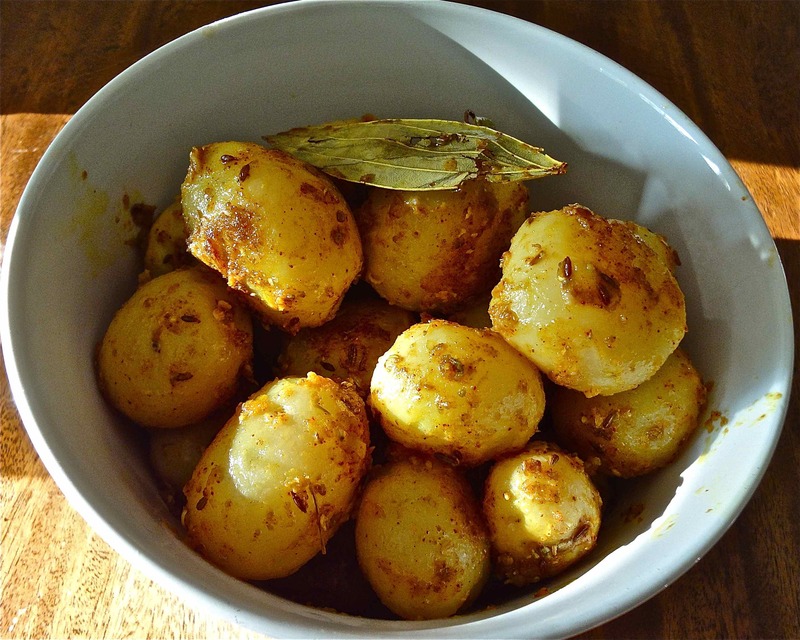 You can use any potatoes to make these, including larger potatoes that have been boiled and chopped into chunks, but I love the sweet and waxy quality of whole baby yukon gold or baby red bliss potatoes. Sookha sabzis and parathas bring memories of picnics and train journeys. My mother insists on packing paratha rolls for any journey: car, train, plane or otherwise, stuffed with a spicy pea and potato filling. When I look at the rolls lining her counter, wrapped individually in foil, ready to go early in the morning, I usually protest at how many she’s made. It’s really not possible to eat so many, I tell her. Yet the rolls always get devoured, quickly and hungrily on the road. Boil the potatoes in salted water until soft and buttery; peel and set aside. Heat the oil in a non-stick pan. Add the tarka spices in this order: asafetida, cumin seeds, bay leaves. As the cumin sputters, add the potatoes. Allow the potatoes to cook for several minutes until the outside starts looking a little golden. Add the rest of the spices: turmeric, coriander powder, cumin powder and the dried mango powder, and salt. Stir occasionally until the spices coat the potatoes and the everything looks golden, crisp and nicely done.